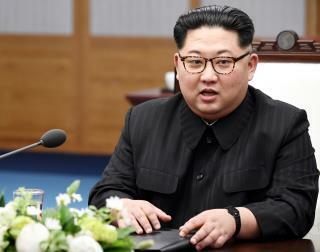 (Newser) – North Korean leader Kim Jong Un said Friday that he would totally denuclearize if America declares the Korean War over and promises not to invade the North, the New York Times reports. Kim made the remarkable statement to South Korean President Moon Jae-in when they met in a village on the border between their two countries and Kim publicly vowed to shut down his nuclear test site. "I know the Americans are inherently disposed against us, but when they talk with us, they will see that I am not the kind of person who would shoot nuclear weapons to the south, over the Pacific or at the United States," Kim said, per a Moon rep. But details released Sunday suggest that Kim wouldn't easily give up his nukes. Kim apparently added that denuclearization would require several trust-building rounds of negotiations and could take a long time. Publicly Kim also promised to open the process of shuttering his nuclear site to experts and journalists from South Korea and the US, reports the AP. The event may serve as a dramatic setup to Kim's nuclear negotiations with President Trump in the next weeks amid widespread skepticism about whether the North will ever fully surrender its nuclear weapons. Yet Kim expressed optimism about meeting Trump: "Once we start talking, the United States will know that I am not a person to launch nuclear weapons at South Korea, the Pacific, or the United States," Kim is quoted as saying. One of the less well publicized conditions is that the United States will send shiploads of Human Growth Hormones to N. Korea. Anyone who believes little kimmy please call me. I have ocean front property in Arizona to sell you.